Many people do not recognize or understand how vulnerable all of their personal information is when it is floating around cyberspace. The fact is that all of those personal details (embarrassing photos, private chats, financial snippets) that are put out there are often easily located and potentially exploited. With this little USB key, that is no longer a worry. With 450 financial backers from Kickstarter and counting, the SurfEasy USB flash drive is a small device that is almost as thin as a credit card. It actually comes in a credit card shaped carrier so that it will fit easily into the user’s pocket, wallet or purse. Essentially, it’s a portable browser with plug-in privacy; seriously, it is really that easy to use. It serves several functions, the first of which is providing privacy. As long as the device is plugged into the computer that is in use, it will wrap the information flowing from that computer to the Internet in an encrypted tunnel. That means that whether that computer is at a WiFi hotspot, a person’s home, an airport or even a hotel, no one can see what is transmitted. All of this comes with no configurations or software installations. Also, it provides a user with a better sense of online freedom. It is not uncommon for many users to be denied access to certain sites from their place of employment because they are blocked by firewalls. This device tears those walls down. Not only can the user access their favorite sites, their employer cannot trace their activity either. As a matter of fact, the SurfEasy USB 2.0 flash drive leaves no trace at all on any computer that it is used in conjunction with. And it also serves as a personal web browser so that the owner never needs to worry about losing passwords and user names at inopportune times. This secure USB flash drive is not all that expensive—with projected costs being between fifty and sixty bucks per device—for all that it does for people who use multiple computers and networks to access their personal online information. SurfEasy seems to have a good thing going here, particularly for people who are not completely tech savvy. After all, there are other ways to protect a person’s private information on the Web. The thing is that regular Joe’s are not only uninterested in this, but it’s like a different language to them. 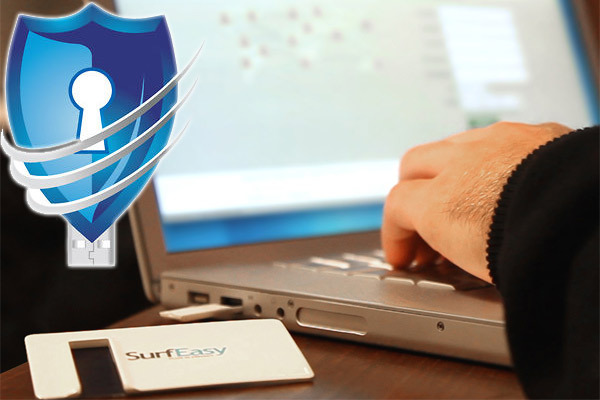 The SurfEasy provides a simple, fairly inexpensive way to make sure they are getting the protection and privacy that they deserve. What are your thoughts on the credit card style USB flash drive? Do you think SurfEasy will be a hit? This entry was posted in Articles, SurfEasy USB Flash Drive, USB Devices, USB Gadgets, USB Technology and tagged credit card style USB flash drive, Kickstarter, Plug-In Protection and Privacy, portable USB browser, secure USB flash drive, SurfEasy, SurfEasy USB 2.0 flash drive, SurfEasy USB Flash Drive, USB Key, USB privacy. Bookmark the permalink.